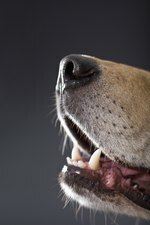 What Can I Do for My Dog That Has a Toothache? Dogs can suffer the sharp pain of a toothache just as acutely as their human owners can. Treatments range from short-term pain relief to veterinary dental care. Recognizing toothache symptoms can help an owners relieve his dog's pain as soon as it becomes evident. Families.com notes that pets can experience pain for some time without showing it, but obvious symptoms in a dog include difficulty chewing, refusal to eat or a sudden habit of pawing at its muzzle. Owners can offer their dogs short-term pain relief while arranging for a visit to the veterinarian. Cold water or finely shaved ice can soothe toothache pain, and baby foods or other soft foods will encourage the dog to keep eating, according to Families.com. Dogs can also safely tolerate a topical pain reliever such as Anbesol for up to two days. A veterinarian can prescribe proper dental care to resolve a dog's toothache. Preferably, however, pet owners should try to prevent their dog's teeth from decaying in the first place by brushing the dog's teeth regularly with a veterinarian-recommended toothpaste. Why Get a Dog Dental Braces?